Discover all the hiddfen gems in the neighbourhood of Elwood. THIS ARTICLE WAS CREATED IN PARTNERSHIP WITH City Of Port Phillip. With so much life and energy around the Australian Open in summer, escape the heat and head down south to Elwood, where quaint suburban pockets, heritage homes, vibrant cafes, and wine bars await. It’s just eight kilometres from Melbourne’s CBD, yet Elwood feels like a town unto itself. Walk east along the canal from Ormond Esplanade on a late summer afternoon and you’ll notice it feels rather like an island: a small beach suburb in the south of Melbourne that is – by way of culture, community spirit, and public transport – a sea apart from the rest of city. Like most islands, Elwood has developed its own calm, sophisticated way of life. The people are kind and young, and always outdoors. 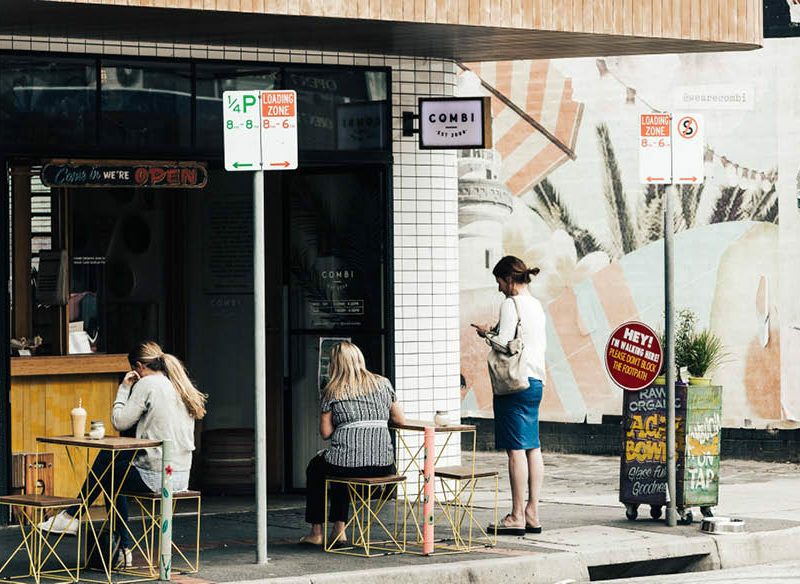 When you’re out walking the wide avenues, marked with big old plane trees and historic Art Deco homes, you’ll catch smiles from mums with prams, and restaurant owners standing out in the street talking to patrons. By day, locals and visitors gather at Elwood Beach where the breeze rolls off Port Phillip Bay and cools the neighbouring streets. 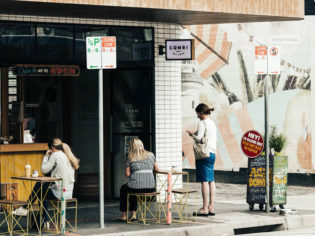 By night, the town transforms as Ormond Road establishments open out onto the footpath for some of the best alfresco dining south of the city. In decades past, Elwood has seen many different lives. As evolution would have it, Elwood’s famed cabaret scene of the 1970s and early 1980s dwindled in the latter part of the century, as its quiet neighbourhood streets and proximity to the city started to attract affluent young families. Alas, today you’ll have to venture into neighbouring St Kilda for late-night action. Yet even without the raw edge, Elwood is a place of history and beauty, dominated by heritage-listed homes and buildings that remain unchanged from the early and middle stages of last century, which make it a quaint and beautiful place to live and visit. If you need to escape the notorious heat during January’s Australian Open, take the short ride to Elwood Beach and spend the day taking in the village. Elwood springs to life every morning at Elwood Junction, the intersection of Broadway, Ormond, and Glen Huntley roads. It’s a vibrant street scene, as cyclists and beachgoers descend on local cafes for morning coffee. A Girl Called Jayne recently opened at the iconic junction in the space previously occupied by Turtle Cafe; a perfect vantage point for people-watching. The cafe is run by head chef Yannick Beaucaine, whose distinguished career spans kitchens in Europe and Australia. He studied molecular gastronomy in Paris before working at two Michelin-starred restaurants, Paris Le Jules Verne and Chateau des Avenieres. While ‘Jayne’ is a little more laid back than Le Jules Verne – which is located in the Eiffel Tower – the simple menu still impresses with a selection of contemporary bistronomy-style dishes from around the world. One of the most charming things about Elwood is its low-lying streets, which, as you head inland, filter downwards, running all the way along the canal into Elsternwick. In the early part of last century, Elwood was an inland swamp, but when the area began to gentrify in the 1980s the local council revitalised the low-lying areas with the Elwood Canal. It’s a grand and ubiquitous feature, planted with an array of beautiful native vegetation. Take a walk along the canal, day or night, and you’ll also get an unbridled view of some of the suburb’s most luxurious and historic homes. Healthy eating and all-day exercise gear is at the heart of every Elwood stereotype, thanks in no small part to Combi Coffee. But in spite of the clichés, Combi has an authentic and inspired approach to healthy fare, with its vegan-friendly menu. Inspired by owner Penny Loughnan, who, among other things, has spent time in the USA learning about cold-pressed juices, staples include the house-made raw organic zucchini spaghetti, sweet sprouted bread with tahini and banana slices, choc mint cheesecake, and the almond latte. Almond milk is made onsite, while the coffee is roasted weekly offsite by Combi. At the weekend, watching skydivers land on the lawn at Elwood Beach is one of the colourful joys of summer. If you’re not prepared to take the plunge yourself, take a picnic rug and park yourself between Elwood and St Kilda beaches, just south of St Kilda Marina. On the hour, parades of parachuters land on the open space to the applause of the crowd. If you’re looking to try something new, take the plunge yourself with Melbourne Skydive. They’re out over Port Philip Bay between Friday and Monday. It’s a drive out to the takeoff point, but you’ll be safely back in Elwood for lunch. They might not quite reach the heights of Melbourne’s hatted eateries, but the Elwood Beach Huts – dotted colourfully along the foreshore, selling simple food, coffee and ice cream – are a wonderful place to set up for a shady afternoon overlooking the water. In summer, there’s a selection of beach huts, food vans and eateries along the foreshore, stretching from Point Ormond (you’re there when you see the white tower on the top of a hill) all the way down to the southern border at Brighton. If you’re in luck, you’ll stumble across Pinchy’s in the Point Ormond car park. The air stream caravan parks itself in Elwood for the summer and serves Maine-style lobster rolls, with pickles, crunchy chips, and ice-cream sandwiches.